Please present coupon at time of purchase. Coupon not valid on previous charges. Good only with this coupon at Right Honda. Not valid with any other coupons or specials. Service includes: Replace oil and oil filter, replace engine air filter, replace micro/hepa cabin air filter, inspect front brakes, inspect and adjust rear brakes, rotate tires, inspect exhaust system, inspect and adjust drive belts, inspect all hoses, inspect coolant, belts and wipers, reset all maintenance lights and road test. Service includes: Replace oil and oil filter, inspect front brakes, inspect and adjust rear brakes, rotate tires, inspect exhaust system, inspect and adjust drive belts, inspect all hoses, inspect coolant, belts and wipers, reset all maintenance lights and road test. Coupon not valid on previous charges. 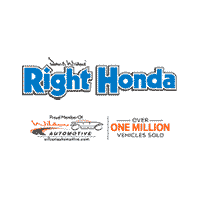 Good only with this coupon at Right Honda. Not valid with any other coupons or specials.